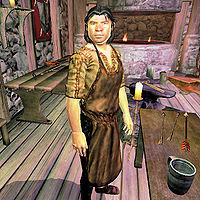 Fjotreid is a Nord smith and the proprietor of the Hammer and Axe in Bruma. He sells weapons and armor and offers repair services. The unique Gauntlets of Gluttony can be purchased at his store and nowhere else. While most other Nords in Bruma spend their time drinking downtown at Olav's Tap and Tack, Fjotreid takes pride in his healthy lifestyle. He works hard every day and allows himself very little spare time, sleeping in the locked bedroom above the shop every night between midnight and 6am and then heading downstairs for business. After spending two hours making sure everything is all right, at 8am he unlocks the door and for the next twelve hours will offer his services to the occasional customer. At 8pm he finally locks up and relaxes on the ground floor for two hours before heading to the Jerall View Inn at 10pm for a late dinner before his bedtime at midnight. During the Battle for Bruma, he stays locked indoors, nervously pacing around and offering his services 24 hours a day. His choice of clothing is typical for a man in his profession: a pair of blacksmith's pants and a blacksmith's apron as well as a pair of rough leather shoes. He carries the shop key and a leveled amount of gold. When you meet him for the first time, he will introduce himself by saying: "Fjotreid. You need armor or weapons, new or repair, come to Hammer and Axe." Fjotreid is disdainful of his fellow Nords and explains: "I work hard. Folks like Skjorta and Olfand give us Nords a bad name, drinking and carrying on until all hours." Esta página foi modificada pela última vez à(s) 06h31min de 25 de agosto de 2013.